Bishop Gwendolyn Phillips Coates, a pastor at God Answers Prayer Ministries in Los Angeles, is trying to change the way her congregation thinks about end-of-life care. MARY HARRIS: That’s Bishop Gwendolyn Phillips Coates, the pastor of God Answers Prayer Ministries in South Los Angeles. She’s been preaching for 50 years--and if that sounds like a lot of time, it’s because she got started when she was barely out of grade school. BISHOP COATES: Yeah, I was a teenager, I really was. I was 13. MH: She’s the daughter of a minister. Her father trained her to follow in his footsteps. BISHOP COATES: On Sunday when the Sunday school teacher didn’t show up, my father would send one of the kids in the room to teach the Sunday school lesson, so they had five children, we are all ministers. 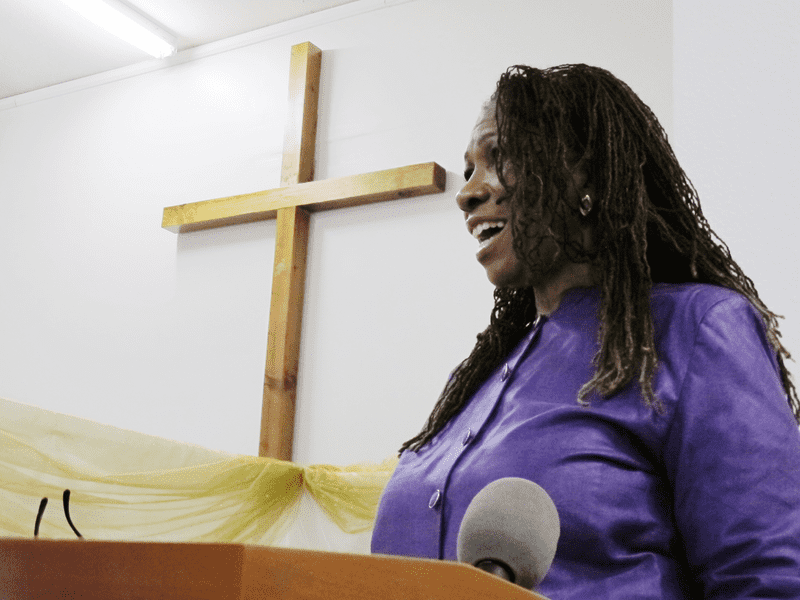 MH: She still preaches each Sunday to a small congregation in a church near Florence and Normandie, the intersection where the ‘92 riots started in Los Angeles. For the past three months, the whole congregation has been talking about grief after losing some beloved members of their church. Bishop Coates has been calling it the 90 Days of Healing, and today, they’re over. BISHOP COATES: Let me ask you today, is everybody doing alright? BISHOP COATES: Are you feeling better? I mean have we opened up some things for you during this time? MH: She’s on a mission to get her congregation to prepare for the inevitable. BISHOP COATES: So the older we get, the more this comes up, so we might as well be prepared, Amen. It’s coming, let’s give our families the greatest gift by talking to them about what we would want during our last days. MH: Bishop Coates talks a lot about death from the pulpit. It’s not something anyone wants to think about. But she says it’s an especially hard conversation in the African American community. She’s learned the hard way that it’s better to be ready, because you never know when death will come. I’m Mary Harris, and this is Only Human. Today on the show: preparing for the most basic fact of life… that it doesn’t last forever. Bishop Coates began thinking about how we plan for death because of an experience she had with love. This is how she talks about her first husband, Leander. BISHOP COATES: Oh, this man was -- I’m, I’m just sorry he wasn’t able to write a book to help men know how to treat a woman. Or I should say -- a king that knows how to treat a queen. MH: I wish he wrote that book too. MH: She met Leander when she was in her 40s. She thought he was the man she’d be with for the rest of her life -- but they were married just three years. It’s been almost 15 years now since he died. But she can still remember how it happened in vivid detail. BISHOP COATES: I was waiting for him to come and take me to lunch, and he didn’t show up. Now this was a very punctual man who was always on time and would end up with flowers. I kept trying to call him and I couldn’t reach him, and this was very unusual. And I got this pain in the pit of my stomach that said something’s not right. MH: She finally was able to reach her son at home. BISHOP COATES: I said I need you to run up the stairs and see if he’s laying in the bed, maybe not feeling well. My son got to the top of the stairs and started screaming at the top of his lungs, because he saw Leander crumpled in a fetal position with blood coming out. MH: Leander had had a brain hemorrhage. He was airlifted to a hospital in Seattle, not far from where they lived. MH: And you’d only been married a couple of years, but suddenly you were the person in the hospital who had to make so many decisions. Had you talked about what you would do if you found yourself in a life or death situation? BISHOP COATES: No. Not with him. We didn’t talk about it. We were making plans for the rest of our life, of course. We were going to grow old together and have lots of fun. And he was the love of my life. And I expected to have this wonderful experience for many, many years to come. MH: Leander was in the hospital on life support for a week while Bishop Coates was sleeping on uncomfortable chairs in the waiting room, bathing in a sink, and trying to figure out what to do. When it was clear that he wasn’t going to survive without the machines ... she had to make the call to let him go. BISHOP COATES: All of us knew that Leander, who was this big wonderful person with a melodious voice that once you heard it you always wanted to hear it again -- He was so full of life. We all knew that he would not want to be in a vegetative state. So we prayed. MH: So did you ever second-guess yourself, when you were making this incredibly hard decision? BISHOP COATES: Not while I was making it. But I certainly second-guessed myself afterwards. It haunted me for a while. I keep going back to the fact that I said, “Lord, this is your child. He’s my man, but he’s your child. So knowing that I submitted to the will of God gives me peace. MH: It was at this point that Bishop Coates made her ministry about helping other people think through and prepare for death. She wanted to save others from being haunted like she was after deciding to let Leander die. And she knew it was her own community that needed to hear her message the most. BISHOP COATES: So in some families and in some communities, they believe that if you start talking about death, not only have you brought it in the room but you’re hastening the actual occurrence for the person that you’re talking to. MH: For a lot of people, talking about death isn’t just tempting fate, talking about death is talking about doctors and hospitals. And Bishop Coates says for African Americans, interacting with doctors is fraught. It was for her own parents. BISHOP COATES: My mother and father used to say a lot I don’t want to be guinea pig for my doctor. Because they had lived a very long time. And my father, in the 30’s, he had seen relatives who had gone out for a walk and never saw them again. And the stories in the family were that was during a time when the medical professional would literally go out and put a bag over the head of African Americans and take them into hospitals and kill them, dissect their bodies, and try to see if there were diseases or if they were any different than anyone else and it was acceptable practice in that day. I mean, if you really think about it, the Tuskegee project was, you know, a long time ago, but it wasn’t until recently that the African American community was even given an apology by our government. MH: The kidnappings she’s referencing were rumored to happen in the South a century ago. In black communities, stories circulated about so-called “night doctors.” And their existence was easy to believe… because there was a history of doctors experimenting on African Americans. The Tuskeegee Syphilis Study is the infamous experiment started in the 1930’s by government health workers. It tested how African American men reacted to syphilis if it was left untreated. The study continued well after there was a known cure for the disease. BISHOP COATES: So the distrust of the medical profession means that I’m not sure that my doctor always has my best interests at heart. MH: Bishop Coates says that distrust makes people push for every last treatment. BISHOP COATES: I’ve seen people who have had absolutely excruciating, horrible deaths, who have died on dialysis machines, who have died in so much pain that the mortuary has difficulty in reshaping the last look on their face so that they can be viewed at a funeral. MH: Death is inevitable, but Bishop Coates believes we can -- and should -- control how we die. So she spends a lot of her time talking about hospice care. That care is meant to help people find comfort as they die, instead of trying to cure them. Fewer than a third of African American Medicare patients get hospice care, compared to half of white patients. Bishop Coates wants to help more people make plans. BISHOP COATES: And then we get on with the business of living and living each day as though it’s our last because we certainly don’t know. MH: After the break, Bishop Coates takes her message to the pulpit. And she finds that some of the toughest conversations are with her own family. I’m Mary Harris, and this is Only Human. MH: Hey. Thanks for listening to this week’s episode of Only Human. We’re a few months into making the show now -- and we want to know what you think! You can find us at onlyhuman.org and on Twitter and Facebook. Are there particular kinds of stories you’d like to hear? Or people you really want to hear from? Tell us. Also, if you haven’t yet, subscribe to the show! You can do that in iTunes, or wherever you get your podcasts. And while you’re there, think about leaving a review. It helps other people find Only Human. And thanks! MH: This is Only Human. After her husband Leander died, Bishop Gwendolyn Phillips Coates started working at a hospice center in Seattle as the community outreach director. She was responsible for one thing -- educating communities of color, mainly African American people, about choices at the end of life. It was a tall order. BISHOP COATES: Hospice has been a very difficult topic to approach for people in the African American community who, first of all, they’re underserved medically, second of all, there are some historical factors that have lead certain populations to believe that medical profession doesn’t care really about you -- they’re trying to kill you in fact. Now there’s another side to that and that is that doctors don’t have the same comfort in talking to people about hospice care as I think I do. They’re not that comfortable talking to you about hospice care until there’s nothing else they can do. MH: You actually started going out into congregations and I’m wondering how you started incorporating into sermons the idea that we should be planning for our deaths. BG: Well, for me, it was easy because I am a minister, so when I called a pastor and let them know that I was coming to talk about this, sometimes I would be invited to preach on that Sunday and help people to understand that hospice care was not physician-assisted suicide nor was it an easy way to help people to end their lives quickly. MH: She walked a lot of families through the process of getting hospice care for loved ones. She’s helped countless others write up legal documents, called advance directives. They let people lay out ahead of time what kind of medical care they want if they get too sick to say. MH: I wonder, was there anyone who rejected what you had to say and what was their reaction? BISHOP COATES: My parents rejected it, (laughter) my parents rejected it! because when I went to work for a hospice organization, they were in their 80s and my mom was sick and was having strokes and at one point, I was living in Washington, they were in California and I would come home and I would talk to them about getting an advance directive for healthcare. And my mother would look at my father and say, “He knows what I want,” and I took that as my cue to shut my mouth, keep being the daughter and not talk about it anymore. MH: Her mother’s death was sudden. Which was lucky in a way, because she never did spell out what she would’ve wanted. MH: So all this time, your mission is to get people thinking about end of life care but with your own parents, it was almost an impossible conversation to have. BISHOP COATES: Yeah, well, it was an impossible conversation for Jesus to have. When Jesus would talk to his disciples about the fact that he was going to be killed but he would raise again on the third day, they immediately began to shut that down, Master, don’t say that to us! And so I’m not saying that I’m Jesus but I’m not surprised that these conversations would be difficult. MH: So I feel like you’re walking this line because you don't want to deny people’s faith in God as a healing agent. But you also want to drive home that we all die at some point and we should be prepared. BISHOP COATES: I don’t tell people to give up their faith. I tell them to receive the additional care and to allow God to be God. But I am helping them understand that they can live differently as they are getting closer to entering the gates. MH: But we all want that hope. That hope that that one last treatment is going to be the one that keeps us going. BISHOP COATES: Everybody doesn’t want that hope. Everybody does not say, let me have that one last treatment. There are people that have said, I’ve had friends who have been diagnosed with cancer, who have asked the doctor, if I don’t accept chemo and radiation, which is going to make me sick, how long do I have? And the doctor would say, about 5 years. And they said, I’ll take 5 years of not being sick all the time rather than going through these extreme measures. So everybody is not looking for that one last hope, everybody feels that maybe their one last hope is to go on a cruise or to go to Africa or to go to Disneyland. Sometimes that’s the last hope and not the last hope of treatment. MH: It sounds like what you’re doing is trying to encourage, not just trust between the African American community and physicians, but trust in yourselves to make the best decisions. BISHOP COATES: Oh most definitely because trust really goes beyond ethnicity. I’m telling you, every ethnicity has told me the difficulty in having these conversations with loved ones, but we can have it and then get on with our life and that’s what I tell people. Having the conversation is not a death sentence, having a conversation is one of the greatest gifts that you can give to someone because you never know when things might happen so quickly that you don’t have the opportunity to have the conversation with them at that time. MH: A lot of people would say, oh it’s so depressing. I want to talk about how we can have this conversation and then get up and go out to dinner or get up and go to the aquarium at Long Beach and continue to live our life. MH: Bishop Coates moved to Southern California a few years ago after her mother died. She remarried and started preaching with her new husband, Terrence Stone. He was also a pastor, at God Answers Prayer Ministries. And they were both committed to making health issues part of the church. This past summer, their religious mission collided with their personal life. Terrence had diabetes. When he reached the point of having to rely on dialysis, he chose hospice care instead. Even though she’d worked for years to help people choose how they want to die, Bishop Coates wasn’t ready to see him go. BISHOP COATES: I disagreed with his decision, but it was his decision ultimately to have. So I honored his wishes all the way to the end. And that was the position that I took and it gave me peace. MH: My heart goes out to you. Because I just can’t imagine being there. BISHOP COATES: Yeah yeah, well, you know, when you see someone that’s so sick, you see someone that can not eat, and you see someone who’s body has betrayed them, I began to pray that the Lord would hasten coming for him because I wanted him to have peace and he couldn’t have it on this side so go get it on the other side. MH: I wonder if the decision to have hospice care freed you up to have a different experience of being with him than you would have had otherwise? Did it let you say goodbye in the way you wanted it to? BISHOP COATES: He knew he was leaving sooner than I did. Sometimes, a patient that knows they’re dying will begin to shut down and begin to close out or push away people who are close to them - and so he began to do that and I even honored that because we had our time of talking. He had put in his advance directive that he didn’t want anyone holding his hand all the time and rubbing him and he didn’t want all that talking - and singing. MH: I love that he put that detail in. BG: Yeah, he did all of that so you know he got what he wanted. So I was able to say goodbye to him as we were getting closer and in intervals and I actually had just laid down and had fallen asleep when he passed away. So I felt like he didn’t want us to be there with him when he actually died. MH: So he got his wish. BISHOP COATES: He got his wish, he got the death he wanted. MH: How do you envision your own death? BISHOP COATES: I try not to envision my own death. [laughter] I want the Lord to allow me to just go to sleep and wake up in heaven, I mean that's the ultimate, right? MH: That’s what we all want. BISHOP COATES: But in case -- yeah, but in case I have an illness that is life limiting, I would rather have hospice care than end up in a sterile hospital room, so I really envision myself having a very good death. I just want to get up, walk across the room and that's it. But God knows and to be honest with you, he doesn’t pay a whole lot of attention to me. [laughter] I really wish I could be calling the shots and say, Lord you know, this is the amount of money that I want,this is the car I want to drive, this is the house I want to live in and if you see fit for another tall dark and handsome in my life, this is exactly what I want him to look like -- God’s not paying me any attention. BISHOP COATES: You’re so welcome, and thank you. MH: That was Bishop Gwendolyn Phillips Coates. We want to know what this episode brings up for you. Maybe you’ve been thinking about how to talk to your partner, or a parent or a grandparent about what they want at the end of life. Maybe you’re thinking about what you want for yourself. If you’ve already had one of these hard conversations, do you have advice for the rest of us? Tell us. Send an email to only human at wnyc dot org, or find us on Facebook. Only Human is a production of WNYC Studios.This episode was produced by Paige Cowett and edited by Molly Messick. Our team includes Amanda Aronczyk, Elaine Chen, Kenny Malone, Fred Mogul and Kathryn Tam. Our technical director is Michael Raphael. Our executive producer is Leital Molad. Special thanks this week to Winn Periyasamy and Lena Walker. And also: a big belated thank you to Paul Schneider. His fingerprints are all over last week’s episode -- we truly couldn’t have done it without him.